User design, a book design company based in the UK, kindly sent me a copy of their recently reissued book on punctuation, simply titled Punctuation..? Or not so simply: shouldn’t those two full stops be a three-dot ellipsis? Maybe it was intended to get editors talking. More booklet than book, Punctuation..? consists of 35 illustrated pages aimed at a “wide age range (young to ageing) and intelligence (emerging to expert)”. 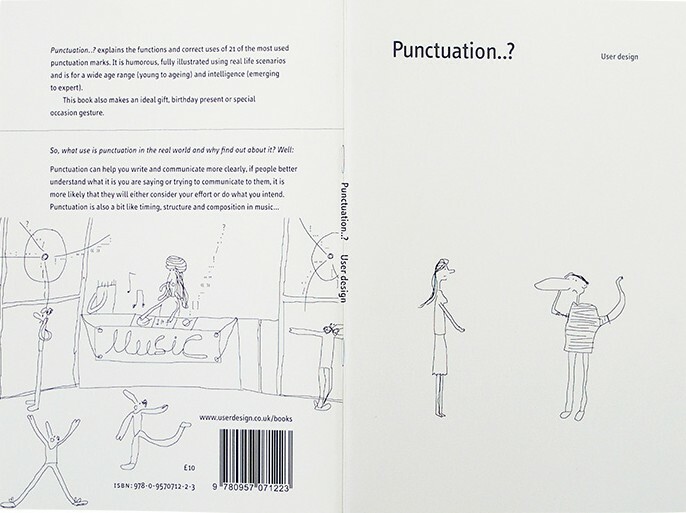 It’s an attractive pamphlet that covers the usual punctuation marks – comma, dashes and co. – and some less familiar ones, such as guillemets [« »], interpunct [·], and pilcrow [¶]. The book’s advice is basic and broadly helpful. General readers won’t mind its traditional definition of a noun as “a word used as the name of a person, place or thing”, though to me this everyday description is dated and deficient. The prose sometimes jars: “As with many rules, there is always an exception”. Well, which is it? Ah! you are wrong, once she sees me cleaned up; washed and shaved, she will find me irresistible! It suggests that when she is washed and shaved, she will find the speaker irresistible. The first comma is also problematic. The same page says exclamation marks are used to “demonstrate hope or regret”, as in “I hope Betty can come!” No: the word hope does that. Elsewhere, words are repeated (“ready to to feed”), omitted (“at end of this sentence”), and questionably hyphenated (hook-up as a verb). Punctuation..? has a sense of fun, particularly evident in the sometimes witty sketches that enliven the book’s already-pleasant appearance. Their style may be seen in the image below. The tone is light and friendly, some of the marks are well described, and there is welcome coverage of technical marks, such as prime symbols, which would often be overlooked in a work of this type. Unfortunately, these virtues are overshadowed by the slip-ups in grammar, style, spelling, punctuation, and fact. Other reviewers have been less critical, but I don’t know if they failed to spot the problems that bothered me, or just didn’t care. Punctuation..? is a nice idea for a book, but it needs – and deserves – more work and better editing. This entry was posted on Tuesday, September 18th, 2012 at 7:45 pm and is filed under book reviews, books, editing, language, punctuation. You can follow any responses to this entry through the RSS 2.0 feed. You can leave a response, or trackback from your own site. 14 Responses to Book review: Punctuation..? This post reminds me of the Murphy’s law on editing coined by John Bangsund. As of now, it doesn’t hold true for your post though! That’s quite a few issues for a book of only 35 illustrated pages. Ouch. aparnauteur: Also known as Muphry’s Law. I try not to fall foul of it. Iola: Yes, and regrettably there are others I didn’t mention. I enjoyed your brief, clearly fair-and-balanced critique of this mini-publication on all manner of punctuation. What struck me almost immediately was the cartoony front cover illustration, w/ the rakishly thin girl, and the guy w/ the large schnoz, and rubber-hose-like appendages. At first glance I thought it was an ‘appropriated’ humorous New Yorker spot drawing by James Thurber , w/ its kind of loose, simple, economical, slightly naive rendering style, so typical of the late, great satirist, Mr.Thurber. But then my eyes drifted over to the back cover illo to the left, where the bizarro quotient had clearly been raised to a whole other level from the rather reserved, but still slightly wacky front cover piece. Immediately, I realized that Thurber had nothing with THIS enterprise. The back-cover piece looked more like a wild linear graphic riff on the famous intergalactic bar scene from Star Wars, w/ all those mingling, weird, Heronymous-Boshian-like characters, perhaps draw by the likes of Chilean surrealist, Matta, or the more contemporary, sadly, late American-born artist, Niki de Saint Phalle. Trust me, both these creative folks were far o-u-t there, always exploring very cool, other-worldly, fantastical dimensions in their art. Stan, sorry for taking this little detour from the topic at hand —punctuation. Getting off-topic, online, seems to be a bad habit of mine. Hmm… to err is human, to forgive, divine, right? Twice now I’ve been asked if I’d like to review the book too. Based on what I’ve seen, I think I was right to pass. Alex: Thurber, yes – I knew the drawing style reminded me of someone, but I couldn’t think who. No need to apologise: you’re relatively on-topic here! Jonathon: For what it’s worth, I think you were. On so many levels: wow. Just wow. In my earlier post I appear to have also ‘botched up’ (pun intended) the spelling of the mystic Flemish painter of bizarre, phantasmagoric imagery, Hieronymous Bosch, having dropped the “i” in his first name, and omitting the letter “c”, between the “o” and the “s” in his surname. Oh well. I dunno. For me, “they are longer than the hyphen which is not a dash” seems to pretty clearly say “hyphens are not dashes”, because the alternative “longer than the hyphen that is not a dash” straight up says some hyphens are dashes. WWW: It needs less wow. Karen: The alternative I have in mind is “the hyphen, which is not a dash”. Omitting the comma makes the clause seem restrictive. Yes, with a comma I can that see that.